That’s right, we’re giving in to the craze and supplying you with yet another pumpkin spice temptation. BUT at least our recipe has the added benefit of protein so you can claim eating them is all in the name of fitness. Blend all of your ingredients together until you get a relatively smooth batter. It’s going to be thinner than you’re used to. Don’t panic! Heat up a nonstick pan with some coconut oil. You MUST use a quality nonstick pan. That means nothing sticks to it! Once your pan is sizzling hot, spoon circles of the batter onto it and turn your heat down one notch. These pancakes are really thick and moist so don’t get impatient. Give them ample time to cook before you attempt to flip them, otherwise you’ll just end up with mush. Adding additional coconut oil to the pan as they’re cooking will make the pan sizzle up and help the sides of the pancakes cook faster. 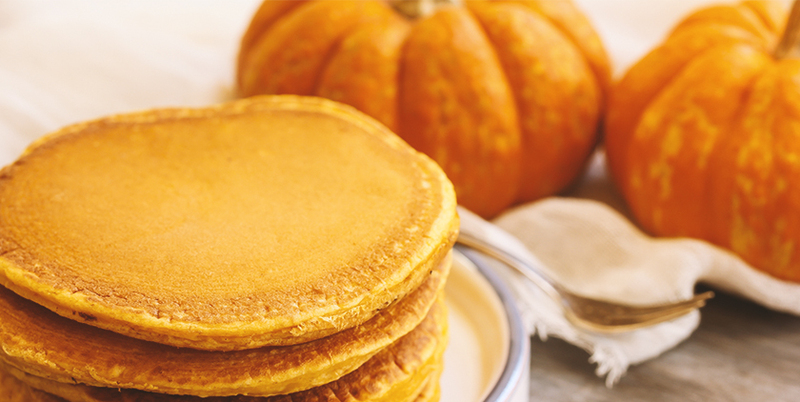 You can also try making smaller pancakes that will flip easier. Once your fast batch of pancakes is ready, repeat steps 3 and 4 until you finish the batter. Finally, top the pancakes with butter, syrup, nut butter, fruit, or if you’re feeling naughty, whipped cream. Enjoy!